Fighting in Syria was paused to allow United Nations aid and food to reach the towns of Madaya, Foua and Kefraya. A deal was struck between warring sides in the civil war on Saturday. The deal permitted food delivery to all three towns, according to multiple media reports. No aid had reached Madaya since October. Doctors Without Borders estimated that 42,000 Syrians have little or no access to food there. Enough food is being sent to feed 40,000 people for a month. Syrians wait for the arrival of an aid convoy on Jan. 11, 2016 in the besieged town of Madaya as part of a landmark six-month deal reached in September for an end to hostilities in those areas in exchange for humanitarian assistance. The town, about 40 kilometers from Damascus and close to the border with Lebanon, will also receive medicine and blankets. U.N. World Food Program, International Red Cross and Syrian Arab Red Crescent supplied the aid for the Madaya mission. A convoy of 44 trucks waited to enter Madaya. The northern villages of Foua and Kefraya will also get assistance. Foua and Kefraya support the Syrian regime of President Bashar al-Assad. Those two towns are now surrounded by rebel troops. Between 12,000 and 20,000 people were cut off from aid in Kefraya and Foua. 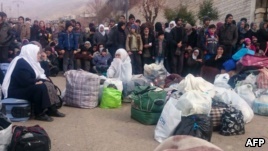 There are numerous reports of extreme hunger and starvation in the Madaya area. Since the beginning of December, six children and 22 adults have died from starvation, according to the multiple media reports. "Syrians are suffering and dying across the country because starvation is being used as a weapon of war by both the Syrian government and armed groups," said an Amnesty International spokesperson.